This is a path finding algorithm using openGL and GLUT to display its output and to allow interaction as well as a self made linked list. It is made in C++ for an assignment during my second year. This was the second assignment in the advanced software development module. 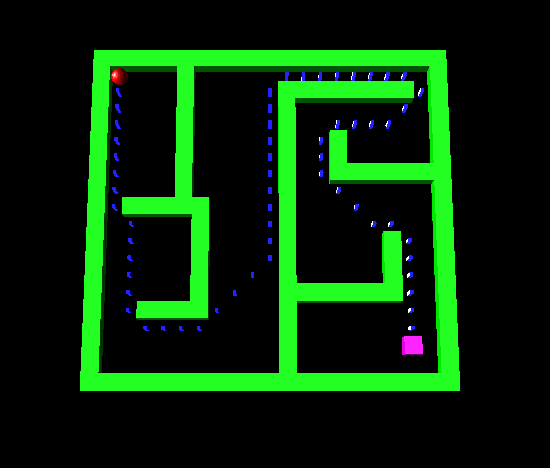 It uses openGL and GLUT to draw the maze and perform picking so the map can be modified. The linked list that I made is a single linked list and is used to calculate the path. The map is stored in a 2D array so that it can be edited and referred to for the path finding. The algorithm used is A* so it uses a heuristic so it tends to go towards the goal when it can.